I know a little girl who yells a lot. She fights with passion (and volume). The last really big one I overheard got me to feeling jealous. I was startled by my reaction — usually I just try and block out the noise and hold tight until it’s over (and then take something for the headache). But the last time, there was no where else to go. The sound followed me to basement and garage and since I couldn’t get away I figured at least I may as well be in my office where I could try and do some work. I have no idea what the fight was about. It’s not important. What was significant was that this young person felt she’d been dealt an injustice and she wasn’t going to accept it. Listening to her go back and forth it was obvious that she held a different position, believed in her position, believed the other person would listen to her and consider her position, and believed that she could make a difference and thereby change her future. There is an incredible amount of hope in her position. 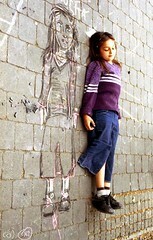 Maybe because she is young, maybe because of who she is, maybe because she hasn’t yet had that hope taken away. Maybe something else. I think a lot of women gave up that hope a long time ago. Too many years of being disrespected, being told we were not entitled to a voice, position, power. Compounded by messages of being a ‘proper lady’ and which of us has a chance? The tag line to the Women’s Studies undergrad program I finished last year is “find your voice”. I don’t think I really found my voice — or if I did I’ve lost it already. Being assertive requires confidence that your position is valid and believing that you will be heard. Constructing a strong argument can be learned in school, but trust? Not likely. Many years ago I shared a house with 4-6 other adults (people came, people went). We shared a fridge, dishes, and kitchen appliances and the deal was that we’d each contribute to the common expenses (like toilet paper) and took turns on the chores like cleaning the bathroom, sweeping the floors, vacuuming, and doing the dishes. There was one roommate who seemed to stretch her contribution as thin as was tolerable. Her turn to buy toilet paper usually meant she stole some from public bathrooms. Sometimes rolls of sandpaper-y stuff, sometimes a stack of those little individual squares. When it was her turn for dish duty she would wash some dishes, but never all. When she was done, the counter top would be unusable because of the dishes drying on it, and the sink would be unusable because there’d still be dishes in it. I never understood the logic of it, I just knew that whenever she was done there was still work for someone else to finish. She might have been using the strategy known as “if I do a really lousy job they won’t want me to do it next time.” Or maybe she thought hers was a legitimate contribution. It drove the rest of us crazy. There’s something about false helping. When you’ve done something, no matter how small, no one can criticize you for not helping. My roommate did in fact do some dishes. It’s just that her helping required the rest of us to do extra work. At her turn to clean the kitchen, we knew that who ever went in there next would get stuck finishing the job. I’m a day late. In my case, it’s only that I’m a day late in joining the chorus of others Blogging for Choice but for a lot of women the words “I’m late” start a spiral of emotions and life altering decision-making. At the Art Gallery of Windsor, there’ll be a film screening tomorrow night, January 24, 2008 @ 7pm of a film that shows what happens where there is no choice for women. The film 4 Months, 3 Weeks and 2 Days is the powerful story of a young woman who gets and illegal abortion in small-town Romania during the dying days of Communist rule. When Gabita decides to terminate her pregnancy � a crime in Romania from 1966 until 1989 � her fiercely loyal university dorm-mate and best friend, Otilia (Anamaria Marinca), accompanies her to a hotel room to be �helped� by Mr. Bebe (Vlad Ivanov), the only black-market practitioner they can afford. When the foul Bebe requests something far more precious than money for his services, the girls descend into a harrowing journey of the soul that is nothing short of shattering. Taking place over a single Saturday in 1987, the film holds an enormous emotional gravitas.It evolves into a profound exploration not only of sorority in harsh times but of choices and responsibility when options are few. The Art Gallery of Windsor is in downtown Windsor, Ontario. When you live with someone and they’re sad and not talking I guess it’s natural to think it’s your fault. But if the person is sad to the point that they’re not talking, not acting like they usually do, are withdrawn, sleeping a lot, maybe crying for no reason that you can see, it’s most likely not you. It’s probably something or many things in the person’s life that are crushing them. Their depression is not your fault. Try to be as supportive, understanding and patient as possible. Speak in a calm, quiet voice. Stay focused on one subject at a time. It may be difficult for your relative to concentrate. Be patient and wait. It may take a while for your loved one to respond. Your ability to listen is a valuable resource to your relative or friend. Depression causes people to talk at length about how bad they feel, yet they may not be ready to discuss solutions to their problems. Listening and letting the person know, in a neutral manner, that you have heard what he or she has said, is a valuable and supportive contribution. You do not have to offer immediate solutions. If your relative or friend is irritable, you probably need to slow down, lower your expectations and use a very neutral approach. Neutral comments about the weather, what you are making for dinner or other routine subjects are the safest way to develop a dialogue. Listen for opportunities to acknowledge or add to your relative�s responses. At these times, conversations about important decisions or issues are unlikely to be productive. You may need to plan to discuss important issues at a later date. Whenever someone suffers from a serious illness, it is natural for family members to feel worried and stressed. In an effort to spend time comforting or helping their loved ones, family members may give up their own activities….Preserve your interests outside of the family and apart from your ill relative. Beyond this I don’t know what else is helpful. If I figure it out I’ll be sure to post something. Sometimes when a person is depressed they feel awfully guilty about disturbing the lives of the people around them, which only contributes to their sense of worthlessness, causing them to further isolate themselves so as not to disturb others even more which leads to sadness over loneliness and rejection — which makes them feel even more worthless, etc etc etc. I don’t know that a fitness class or even a housekeeper can help at this stage. Maybe a counsellor? Over the past three days I’ve written four posts that I’ve decided not to publish. They’re too angsty, too sad, too personal, or contain information that might haunt me someday. It helps to write because it helps me see just how deep this sadness runs. When a post turns to things thirty years old I see that this pain is old. How I got this old I don’t know. Writing keeps me from closing down completely, even if it isn’t ever read by anyone. And that is good. Counsellor, housekeeper, or personal trainer? I’ve switched from snacking on m&m’s to jumbo organic raisins. I figure the sugar rush is the same (and should help me stay awake) but at least with the raisins I’m getting some iron. If I’m so low on energy the extra iron might help me feel more energized. I also found a coupon for a free trial at a fitness centre. I’m waiting for a call back to make an appointment for a tour. It takes time to find a good counsellor and I don’t have time. And dealing with problems, as much fun as that is (not), forces you to think about those problems. I’m not interested. The housekeeper idea is really, really, really tempting. I can pay someone to do the things I cannot manage and this would free up the time I would spend doing them, thinking about doing them, planning to do them, and remembering I didn’t do them yet. And I would have a shiny bathroom and clean floors at least once each week. See how this is tempting? But I’m really not in a position where I feel I can afford this type of luxury. Nobody learns any valuable housekeeping skills or the value of pitching in. I don’t think I’m ready to give up on my family yet. So that leaves exercising. I don’t think I was this depressed when I was dancing and teaching 3+ days each week. That was about one and a half years ago. I felt good, I looked good, I felt good about myself. This is not how I feel lately. I feel worn out: physically and emotionally. I feel gross. Tired. I’m depressed. It seeps into everything I do, all my relationships, all my activities. I’m sure people around me are tired of it. I’ve found a gym that’s not too far away that is open 24 hours. (I cannot believe that grad students at Windsor don’t get access to the facilities on campus.) This other gym I’ve found has a variety of classes at a variety of times. I know aerobics is different from ballet or swing dancing but it’s what I’ve found. There is yoga and pilates which I’ve studied as a dancer so I know I like these already. I’d prefer a dance class but there isn’t one available on a night I can attend. I need something with a flexible schedule and I think this is worth a try. If I have somewhere to go, something to do (besides schoolwork) it might motivate me to keep going afterwards and get my academic career back on track. And if I’m energized enough I might be able to look at housework without being overwhelmed. And if I feel better about myself maybe I won’t need counselling after all. It’s worth a try at least. It could be just the solution to All My Problems. Now I just hope that phone call comes before I change my mind. Life will be okay even if it’s not how I’d imagined. I keep telling myself this and focusing on the wonderful things in my life — and there truly are many of these. But I’m bogged down by the unfinished, the overwhelming, the physical and mental clutter surrounding me. It’s time to make a plan to manage these things. Life is always going to be chaos — such is life with kids, blended families, and an insane ex. I cannot prevent things from being overturned again and again in front of and underneath me. All I can do is find some peace in my life so that when bad stuff goes down I have a store of energy I can draw from. I figure my life has three major categories that make me anxious: school, family, and housework. Each of these has subcategories and of course there’s plenty of overlap. If I can feel caught up (or ahead even) in one area it spills into the others and I feel good. Of course, if I put “me” up there as a category it might help me feel good more often. (:wink:) But then that’s never been my strong point. One goal of this exercise is to figure out where the self care is going to fit in. So looking at each category there are things that have needed doing for a long time and things that require attention on a regular basis. If I can get all these things done I’ll feel much better about where I sit in terms of school work. It actually doesn’t look so bad now. No really clear answers pop out on these. Hmmm. At least now I know what I need to think about. This is where I’m overwhelmed. There are so many loose ends from the move. Construction isn’t done yet. Stuff from my house is in a big pile in the middle of the basement. The kids need help organizing their rooms. Our bedroom is full of boxes of stuff. My office space is disorganized. Rob’s office space is brimming and he still has lots of his stuff spread out around the house. I hate living in the clutter. When I moved this summer I threw so much stuff in the trash — I lined the curb again and again with garbage bags. How can I still have so much stuff that passed the cut? I know I have to go through it again and get rid of more…but it takes a lot of time. And I can only do it with my own stuff. Eventually my stuff will be under control but will it be enough? My kids have too many toys and clothes they don’t wear but we don’t have enough time to get to it. And Rob and his daughter are pack rats. I grew up passing toys and outgrown clothes to shelters. My parents live in a very tidy home partly because they’re both really good at cleaning but also because they keep the contents down and are always cutting back. Clothes that aren’t worn get passed on. Books that are old are passed on. 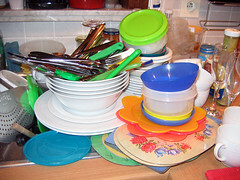 Dishes that don’t stack well or are a pain to clean or take up too much space are passed on. If it’s not in use and/or adding to joy in the house, and is not likely to be in use again soon it goes. My old place was a mess of clutter. I know it. It was small and had stuff from way to many ages and stages (baby stuff to teenager stuff, sewing supplies from when I used to sew for a living, ballet stuff from when I taught, school stuff that I still use, and activist materials from every cause I’ve ever been involved in). Everything was important. But this big move prompted a huge purge. It was a chance for me to start fresh. And Rob’s house is so nice. I want it to stay that way. I know with my collecting of important papers (which I go through later and usually end up tossing) and Rob’s attachment to anything that enters the house, we’re in grave danger of living in a fire trap. And I know that the daily cleaning is going to get harder still if we keep on this way. dividing some of this up so that each person has something they’re in charge of. Asking someone to do something is like setting up for battle sometimes. If it were automatic I’d have a lot of energy left over. It’s a lot harder doing these things here, in the new house, all blended-family-style, than it was in my own house, on my own, with my own kids. I’m hoping that it will get easier with time. For one thing my house was a lot smaller. Another was that my house was in rough shape so anything I did made an improvement. Here I feel responsible for keeping the house in good condition. There are a lot more people here now (me and my kids) and things can go downhill pretty quickly if they’re not looked after. Things are further complicated by the kids’ different and complicated schedules. Every-other-weekend-ness (for my kids) and skating-gymnastics-piano-piles o’ homework (Rob’s kid) doesn’t make it easy to divide responsibilities. And the fact that Rob and I have different expectations re: bedmaking, clean bedrooms, helping etc. turns into a chorus of “why do I/we have to if she/they don’t have to?” Rather than pushing the issue I tend to just do as much as I can. Since it’s my issue. So right. If I can look back at the list and see the things that are under my control I can do something about them. It’s a good place to start at least. And who knows, maybe the rest of the family can make lists of what they’d like to take care of and we can all help each other. It could happen! Graduate students are supposed to read, research, think, discuss, write, present, read, research, think, etc ad infinitum. My job should be to go to school then come home and study in isolation, with occasional breaks for midnight rollerblading and Chinese takeout. It’s supposed to be a lot of work, but it’s supposed to be doable. For some crazy reason, maybe because I managed an undergraduate degree with small children around, I thought I could do this too. It’s been an interesting month and a half — maybe because of the fun I’ve been having with family law court, police, children’s aid, and counsellors (could another agency possibly be interested in my life?). Somehow I think that even if my life were stable, with no drama or crises, it would still be too much to be a grad student and mother. I met a 4th year student yesterday who is married, planning to do the MA next year. He’s only a few years younger than me — in his early 30s. His wife lives one and a half hours away, he has an apartment here… he has a kid that doesn’t live with him and she has 3 kids — but they’re her kids, not his. Because they are her kids, according to their arrangement, there’s no need for him to be there. He’s focused on one part of his life — school. I don’t have that option. My identities are completely interlocked. I’m not a student from 9-5 and a mother from 5-9 and a partner from 9-midnight. I cannot separate out one piece of my self and put the rest on pause or say they are insignificant or disposable. I am all of me. Like it says in my bio on this site: I am a feminist-activist-artist-geek-parent-student. I am all of these things at once. I can do what I do because of all of these things. The skills that I have, the insight that I bring, I bring because of these multi-dimensions. Alas, the Institution of Academia is not made for real people. To receive funding I must be a full-time student. The perception is that unless I am full-time, I am not a serious researcher, that maybe I have a job somewhere. Maybe it’s time (or past time) for Academia to realize that there are other responsibilities in a person’s life and that these other things do not preclude people from making contributions to the Academy. As long as the system runs as is, the only people in academia will be the ones that fit the mold: young people, no family responsibilities, no primary childcare responsibilities. Hmmm sound familiar? This is going to be a problem because more and more people want undergraduate degrees and there aren’t enough good teachers to fill the roles. By excluding a woman like me from academia, a good potential educator and researcher is lost. There has got to be a change. Maybe more distance education options, maybe a part-time option with funding. It’s sad to think I may have to give this up because the logistics are beyond me. My daughter came home last night. I have to wonder if maybe I’ve saved her life. I know too many kids whose families are divorced. They found living with one parent too difficult and either left or got thrown out and sent to live with the other parent. Of course it was only ever a matter of time before things got rough there and the kid is faced with going back to the first parent (if they’ll even have them back) and the alternative of setting out on their own, running away, moving in with someone they shouldn’t, or the unknown. The kids who bounced from one parent to another to a grandparent always described feeling alone, lost, like no one cared. I don’t want my daughter to ever feel that way. So even though we’re in a tough place now, my daughter knows I love her. She knows I want her. I haven’t given up on her, sent her to live with her father, put her in foster care, or chosen one of the many other options I was presented with over the past week. I want her here. I’m sad that she’s so unhappy, but with the team of professionals that is assembling, we’re going to do our best to see that she doesn’t slip into an unsalvageable disaster of a life. It’s hard when you see someone with so many talents, so much potential, just throwing it away. I’m looking at the longterm, and I guess that’s both the joy and the burden of parenting. I have to think about what’s best for her longterm, what will give her the best opportunities in life, and not just what will make her smile today, in the short term. Parenting is more than ice cream and Lego. It’s also about hard and unpopular decisions, like moving to a better school district, toothbrushing, and dark green leafy vegetables. As her parent, I have to consider her future, and not to dragged down by her teen angst.